Jamika Smith is the founder of Teena’s Legacy, a furniture reupholstery apprenticeship program named for her grandmother. Four young women are in an airy living room in the Chicago Lawn neighborhood. They are learning how to reupholster second-hand furniture. As the sound of a stapler echoes throughout the home, one is pulling them out from a worn chair. Across the room Laquisha Clinton refurbishes a foot stool. 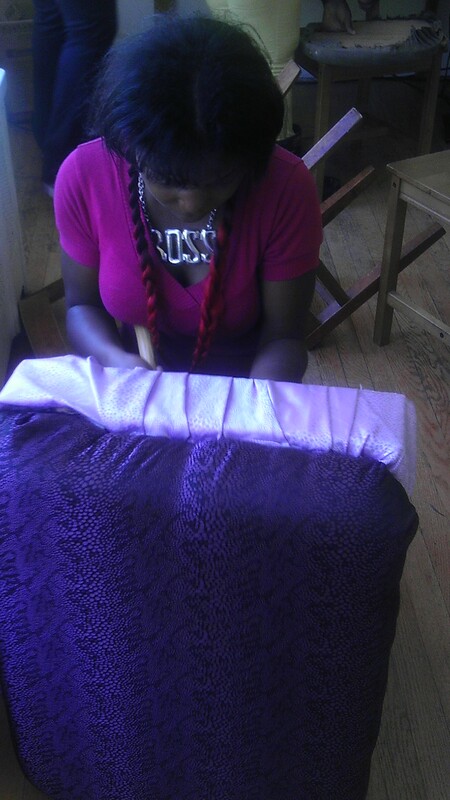 She picked out some fabric the color of regal purple. “It shows my gratitude and attitude toward fashion,” Clinton said. Jamika Smith is trying to teach a trade that she hopes will lead to self discovery for a group of Englewood girls. There’s a lot of talk about the high youth unemployment rate in Chicago. For black youth, the figure is close to 90 percent. But girls are sometimes left out of the conversation. Smith first learned how to restore furniture from her grandmother Miss Teena. As a teen, she didn’t always appreciate her grandmother’s skills. But the garbage dump isn’t so bad now. That’s where she finds pieces for the girls in her apprentice group. She calls it Teena’s Legacy in honor of her late grandmother. Smith said learning a trade is important but she has bigger aspirations for these girls. For Smith, repairing furniture is a metaphor. All the girls are from Englewood, a neighborhood rocked by high unemployment and poverty with few activities for youth. “I probably would be outside with my friends all summer on the streets even though I know the streets can be dangerous,” said 17-year old Jannie Ross. She’s wearing a Cleveland Browns football jersey as she puts the final touches on a cotton candy colored chair. She painted it pink and added fake fur. “Fluffy is just like my personality. Bubbly. The pink feels sympathy for me. Because I have a lot of sympathy for some people I know going through a lot of stuff like I am,” she said. Now Jannie’s adding rhinestones. The blinged-out chair looks like it belongs in a Las Vegas hotel. Teena’s Legacy is a pilot summer program. Smith wants to raise more money to work with more girls throughout the year. Smith said her young charges may not go into the furniture business full time. She hasn’t. But knowing a trade gives them a chance to earn a little money on the side. “At the end of the day it’s important that we invest in our women because they are powerful and they do have influence,” Smith said. Take Shawtiana Clinton, for example. She took an “ugly brown chair,” as she describes it, and put a new pattern on it. Shawtiana said that print now makes her feel powerful.